Inherited by QGroupBox, QScrollView, QDockWindow, QGrid, QHBox, QLabel, QLCDNumber, QLineEdit, QMenuBar, QPopupMenu, QProgressBar, QSplitter, QToolBox, and QWidgetStack. It draws a frame and calls a virtual function, drawContents(), to fill in the frame. This function is reimplemented by subclasses. There are also two other less useful functions: drawFrame() and frameChanged(). QPopupMenu uses this to "raise" the menu above the surrounding screen. QProgressBar has a "sunken" look. QLabel has a flat look. The frames of widgets like these can be changed. The QFrame class can also be used directly for creating simple frames without any contents, although usually you would use a QHBox or QVBox because they automatically lay out the widgets you put inside the frame. A frame widget has four attributes: frameStyle(), lineWidth(), midLineWidth(), and margin(). The frame style is specified by a frame shape and a shadow style. 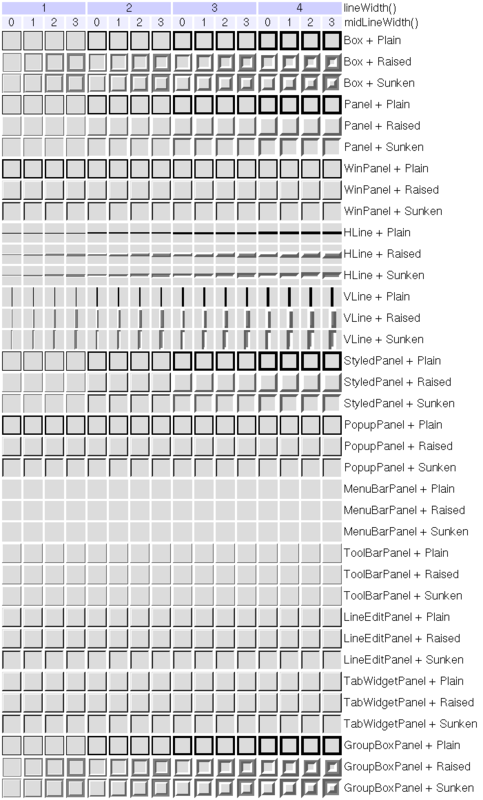 The frame shapes are NoFrame, Box, Panel, StyledPanel, PopupPanel, WinPanel, ToolBarPanel, MenuBarPanel, HLine and VLine; the shadow styles are Plain, Raised and Sunken. The line width is the width of the frame border. The margin is the gap between the frame and the contents of the frame. This enum type defines the 3D effect used for QFrame's frame. Shadow interacts with QFrame::Shape, the lineWidth() and the midLineWidth(). See the picture of the frames in the class description. See also QFrame::Shape, lineWidth, and midLineWidth. This enum type defines the shapes of a QFrame's frame. QFrame::StyledPanel - draws a rectangular panel with a look that depends on the current GUI style. It can be raised or sunken. QFrame::WinPanel - draws a rectangular panel that can be raised or sunken like those in Windows 95. Specifying this shape sets the line width to 2 pixels. WinPanel is provided for compatibility. For GUI style independence we recommend using StyledPanel instead. QFrame::LineEditPanel - is used to draw a frame suitable for line edits. The look depends upon the current GUI style. QFrame::TabWidgetPanel - is used to draw a frame suitable for tab widgets. The look depends upon the current GUI style. When it does not call QStyle, Shape interacts with QFrame::Shadow, the lineWidth() and the midLineWidth() to create the total result. See the picture of the frames in the class description. The parent, name and f arguments are passed to the QWidget constructor. Returns the rectangle inside the frame. See the "contentsRect" property for details. Virtual function that draws the contents of the frame. The QPainter is already open when you get it, and you must leave it open. Painter transformations are switched off on entry. If you transform the painter, remember to take the frame into account and reset transformation before returning. This function is reimplemented by subclasses that draw something inside the frame. It should only draw inside contentsRect(). The default function does nothing. See also contentsRect and QPainter::setClipRect(). Reimplemented in QLabel, QLCDNumber, QMenuBar, and QPopupMenu. Draws the frame using the painter p and the current frame attributes and color group. The rectangle inside the frame is not affected. This function is virtual, but in general you do not need to reimplement it. If you do, note that the QPainter is already open and must remain open. See also frameRect, contentsRect, drawContents(), frameStyle(), and palette. Virtual function that is called when the frame style, line width or mid-line width changes. This function can be reimplemented by subclasses that need to know when the frame attributes change. The default implementation calls update(). Returns the frame rectangle. See the "frameRect" property for details. Returns the frame shadow value from the frame style. See the "frameShadow" property for details. Returns the frame shape value from the frame style. See the "frameShape" property for details. The default value is QFrame::NoFrame. See also setFrameStyle(), frameShape, and frameShadow. Returns the width of the frame that is drawn. See the "frameWidth" property for details. Returns the line width. See the "lineWidth" property for details. Returns the width of the margin. See the "margin" property for details. Returns the width of the mid-line. See the "midLineWidth" property for details. Processes the paint event event. Paints the frame and the contents. Opens the painter on the frame and calls drawFrame(), then drawContents(). Processes the resize event e.
Adjusts the frame rectangle for the resized widget. The frame rectangle is elastic, and the surrounding area is static. The resulting frame rectangle may be null or invalid. You can use setMinimumSize() to avoid those possibilities. Nothing is done if the frame rectangle is a null rectangle already. Sets the frame rectangle. See the "frameRect" property for details. Sets the frame shadow value from the frame style. See the "frameShadow" property for details. Sets the frame shape value from the frame style. See the "frameShape" property for details. The style is the bitwise OR between a frame shape and a frame shadow style. See the illustration in the class documentation. See also Illustration, frameStyle(), colorGroup, and QColorGroup. Examples: cursor/cursor.cpp, layout/layout.cpp, listboxcombo/listboxcombo.cpp, rangecontrols/rangecontrols.cpp, scrollview/scrollview.cpp, tabdialog/tabdialog.cpp, and tictac/tictac.cpp. Sets the line width. See the "lineWidth" property for details. Sets the width of the margin. See the "margin" property for details. Sets the width of the mid-line. See the "midLineWidth" property for details. This property holds the rectangle inside the frame. Get this property's value with contentsRect(). See also frameRect and drawContents(). This property holds the frame rectangle. The frame rectangle is the rectangle the frame is drawn in. By default, this is the entire widget. Setting this property does not cause a widget update. If this property is set to a null rectangle (for example QRect(0, 0, 0, 0)), then the frame rectangle is equivalent to the widget rectangle. Set this property's value with setFrameRect() and get this property's value with frameRect(). Set this property's value with setFrameShadow() and get this property's value with frameShadow(). See also frameStyle() and frameShape. Set this property's value with setFrameShape() and get this property's value with frameShape(). See also frameStyle() and frameShadow. Note that the frame width depends on the frame style, not only the line width and the mid-line width. For example, the style NoFrame always has a frame width of 0, whereas the style Panel has a frame width equivalent to the line width. The frame width also includes the margin. See also lineWidth, midLineWidth, frameStyle(), and margin. Get this property's value with frameWidth(). Note that the total line width for HLine and VLine is given by frameWidth(), not lineWidth(). Set this property's value with setLineWidth() and get this property's value with lineWidth(). This property holds the width of the margin. The margin is the distance between the innermost pixel of the frame and the outermost pixel of contentsRect(). It is included in frameWidth(). The margin is filled according to backgroundMode(). See also margin, lineWidth, and frameWidth. Set this property's value with setMargin() and get this property's value with margin(). Set this property's value with setMidLineWidth() and get this property's value with midLineWidth().